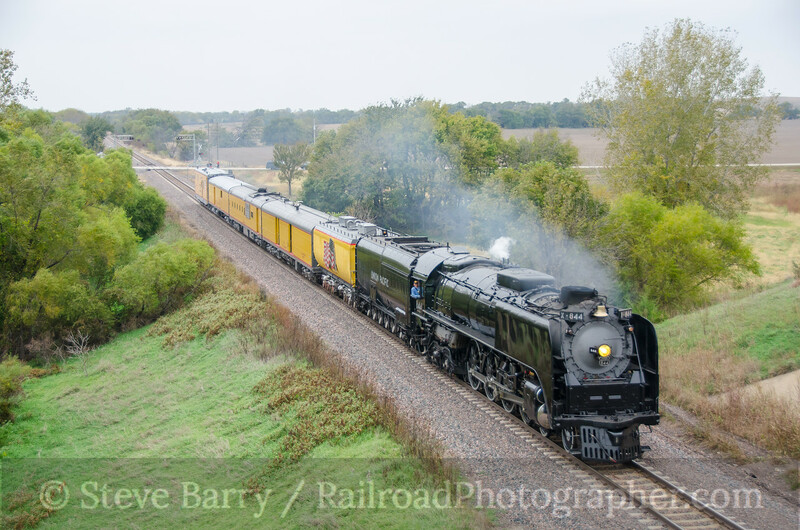 It's been an unusual year -- the mainline steam locomotive I've chased the most has been Union Pacific's recently restored 4-8-4 No. 844. 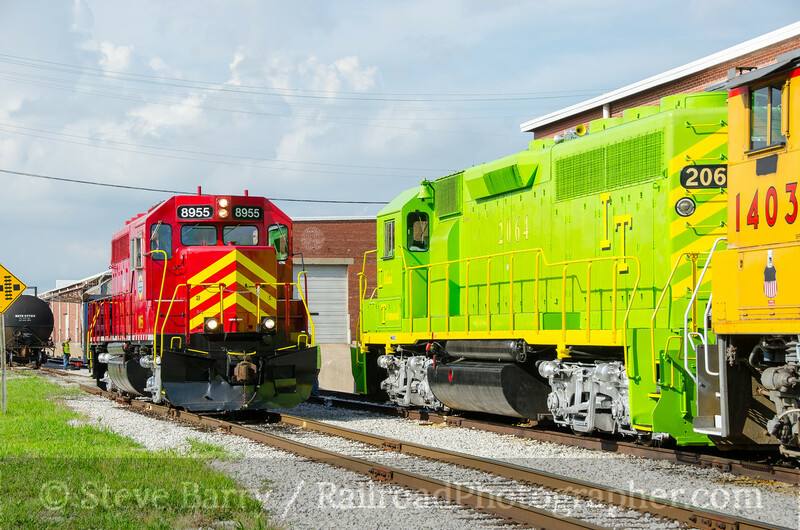 The funny thing is, a month before chasing the locomotive each time, I had no idea I'd even be seeing it. 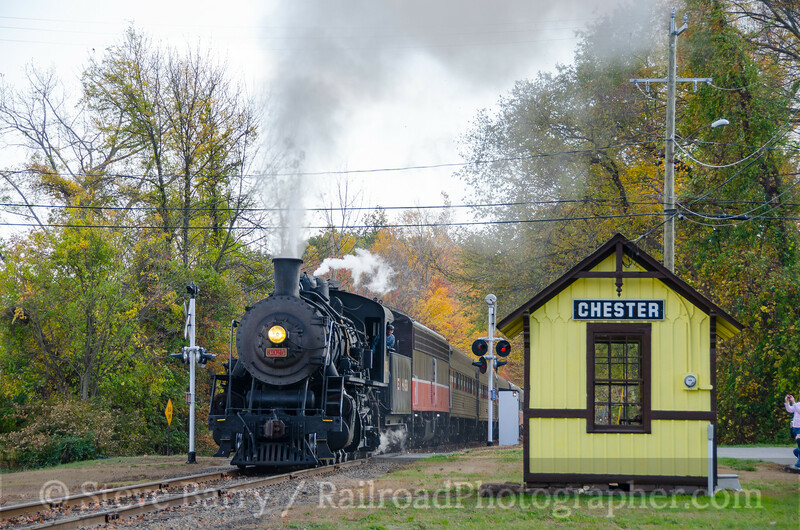 The railroad announced plans to run it after I had made arrangements for trips, and it was just coincidence that my trip and the locomotive coincided. I saw it a few times in Colorado in July as it ran back and forth in conjunction with the annual trip for the Denver Post's run to Cheyenne Frontier Days (all of which was covered in this post on my big western trip). I was just getting on the road back from Colorado when I found out I'd need to make a trip to Kansas City in October, needing to be there on the 15th. It was quite a bit later I found out 844 would be traveling from Cheyenne to Memphis, making an overnight stop in Kansas City after it arrived. On the 15th! 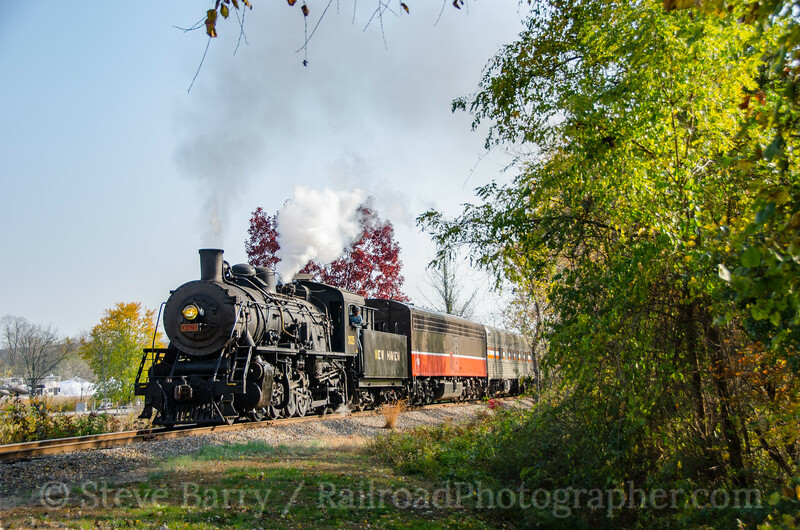 I had planned on leaving KC on the 16th, but the locomotive was going to continue east on the 17th to Jefferson City, Mo., so I added a day to my trip to work in an extra day of chasing. I arrived in Kansas City on October 14, spending the night there. 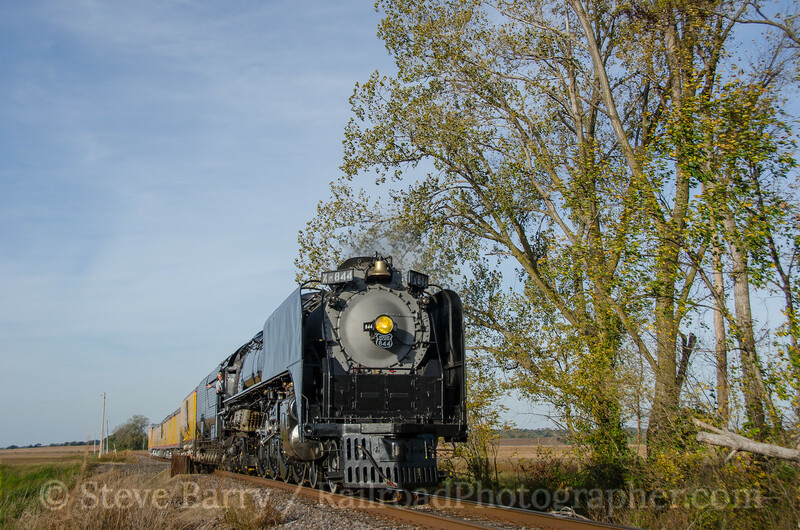 On the morning of the 15th I headed west to intercept the big Northern along with Otto Vondrak. 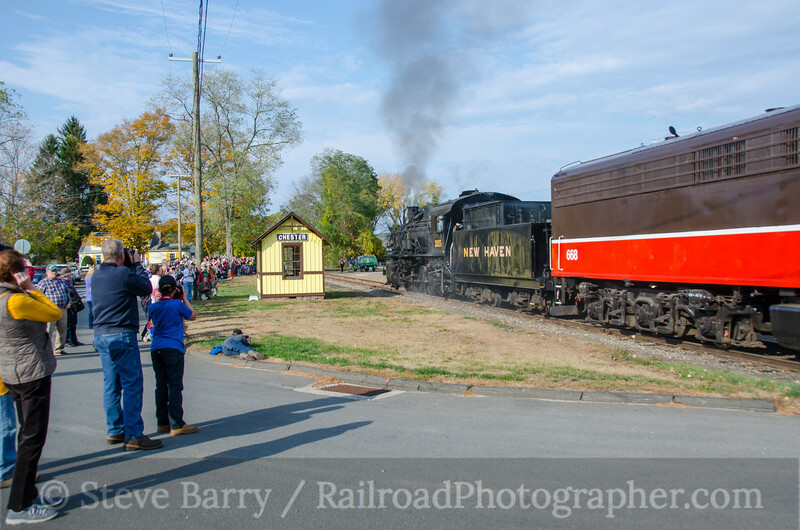 Kevin Gilliam, who was shooting video for Trains magazine, and Mike Noonkester followed behind us. It had a servicing stop in Marysville, Kan., so I arrived at the small town of Winifred and waited. 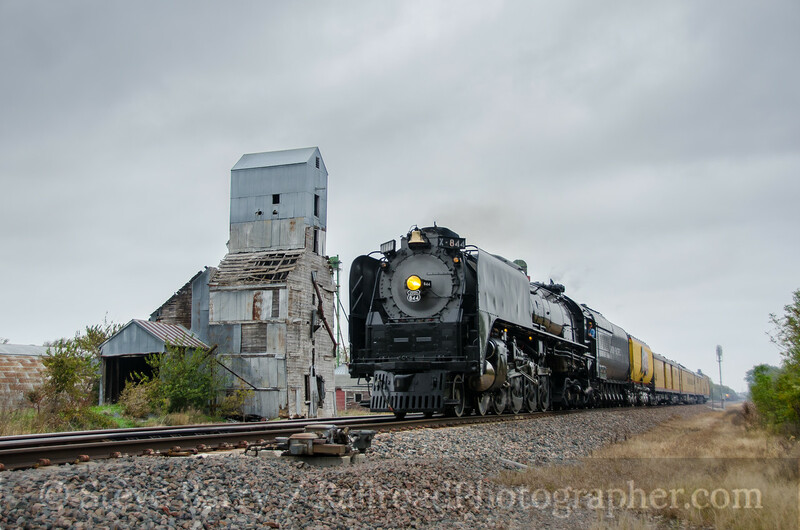 An old grain elevator made a nice backdrop as the locomotive came through on the gray day. 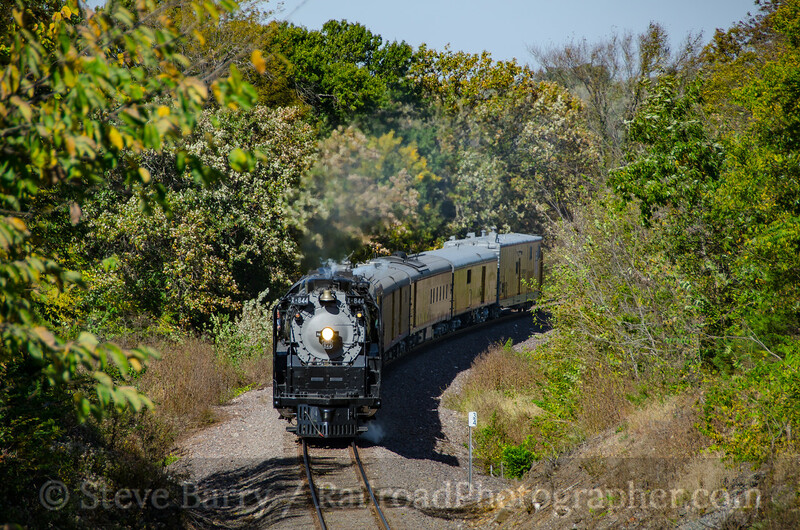 The short train had a servicing and display stop just ahead at Frankfort, Kan., so we buzzed just a mile or so ahead out of town and caught it crossing the Black Vermillion River. With its next servicing/display stop well over an hour away at Topeka, we thought we might have a chance to get ahead of it before the stop. The roads are laid out in a grid pattern -- and unfortunately the railroad runs diagonally through it all, giving it a much shorter route. Still, we got ahead of it at Emmett, Kan., but not by much. 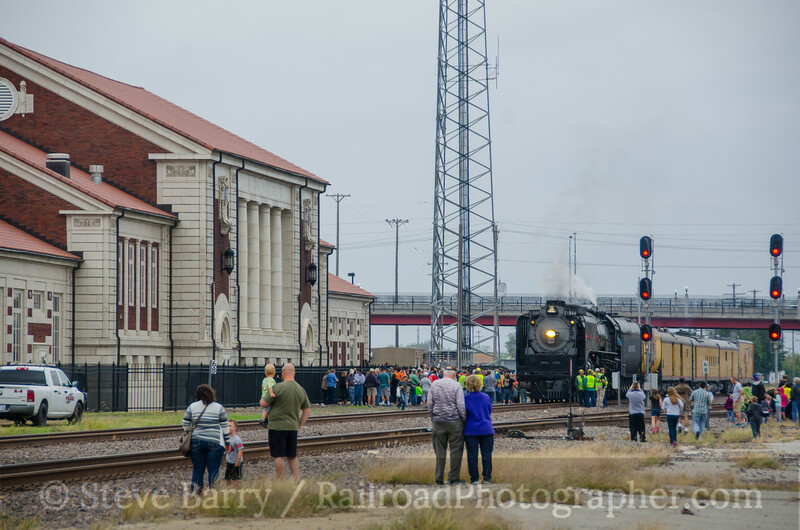 The train beat us into Topeka, but we wheeled into town for a quick shot of it as it stopped among the crowd at the large Union Pacific depot. 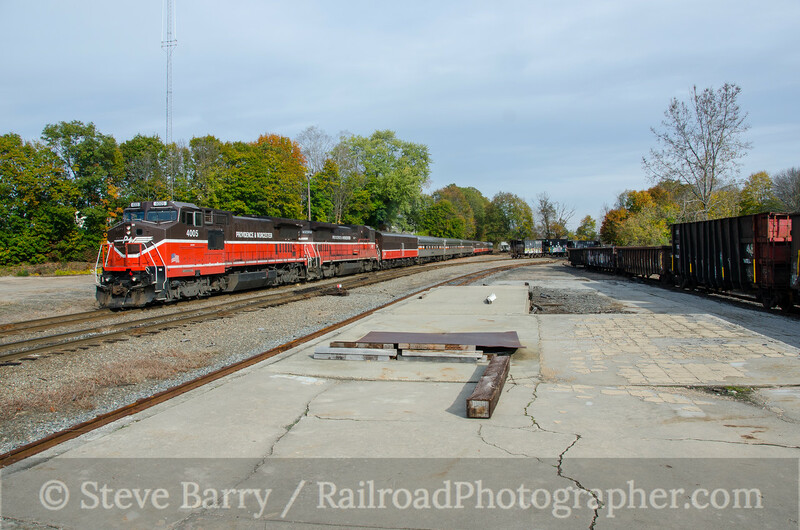 The next servicing/display stop would be at Lawrence, Kan. Lawrence was the home of a noted rail photographer (and one of my early photographic heroes), the late Don Ball, Jr. 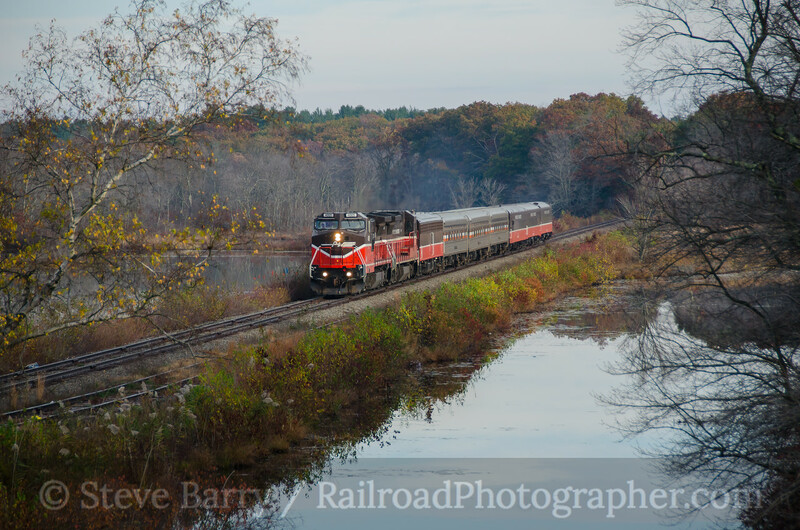 He shot a lot of photos on the big curve near the station, and that curve has been unofficially dubbed "Don Ball Curve." Wanting a shot there, we headed into Lawrence and once again got the large crowd greeting the train as it arrived. 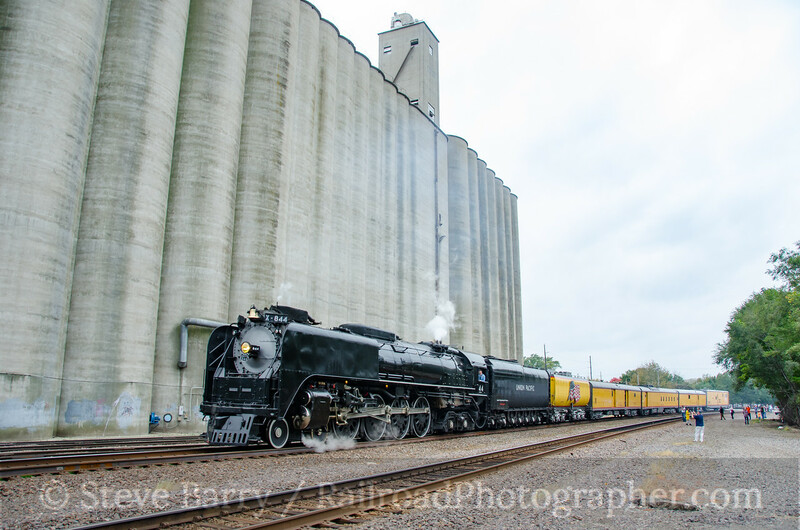 After the servicing stop, the train accelerated away, passing the large grain elevator that borders Don Ball Curve. From here we gave up the chase and headed into Kansas City for our evening appointment. 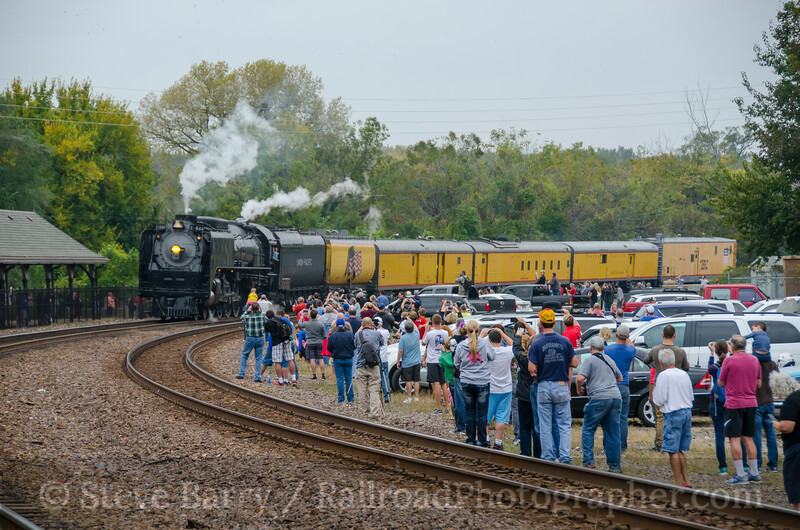 After spending Sunday, October 16, in Kansas City (perhaps more on that in a future post), it was time to chase 844 again as it ran to Jefferson City. It's first stop would be at Buckner. I was driving solo this time, with Kevin and Mike still chasing in their car. Since they had a navigator, I opted to follow them. The first point we picked was just west of the town of Buckner. The weather was much better on this day, with mostly sunny skies. 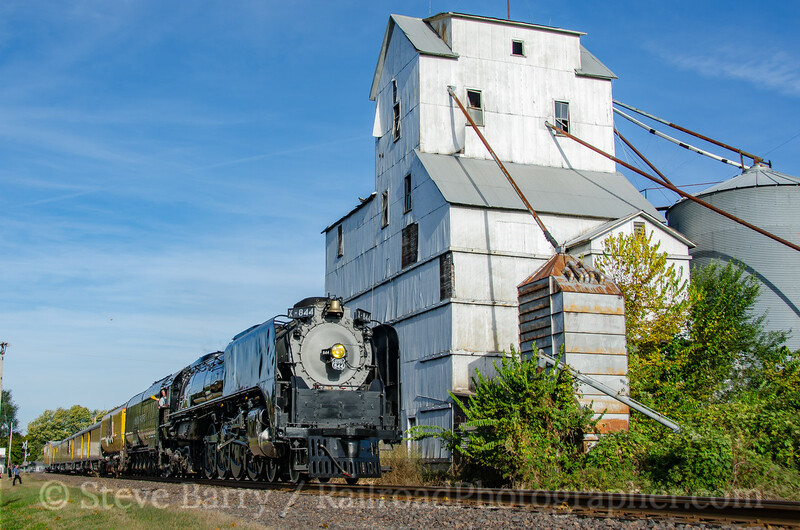 Grain elevators are a part of the U.S. Heartland, so the next stop would be at one. Our next shot was in the small community of Levasy, Mo. 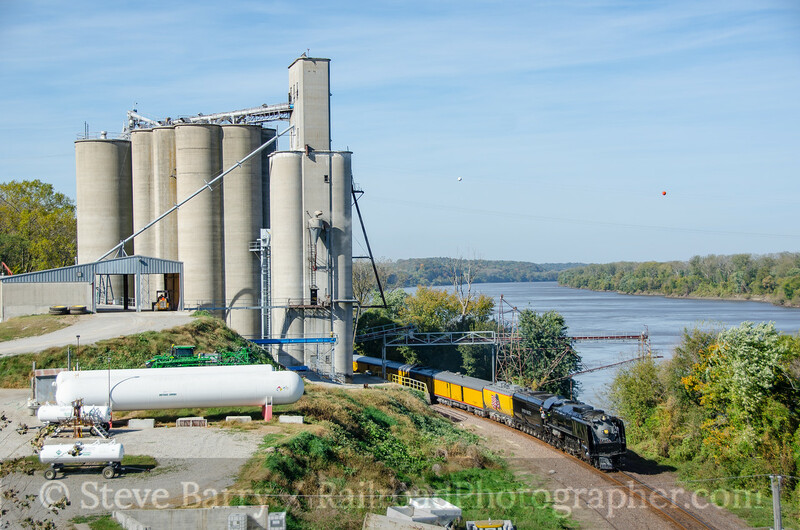 The train rolled along the Missouri River, stopping at Lexington. We used that stop to find a perch overlooking the railroad and river at Waverly, Mo. 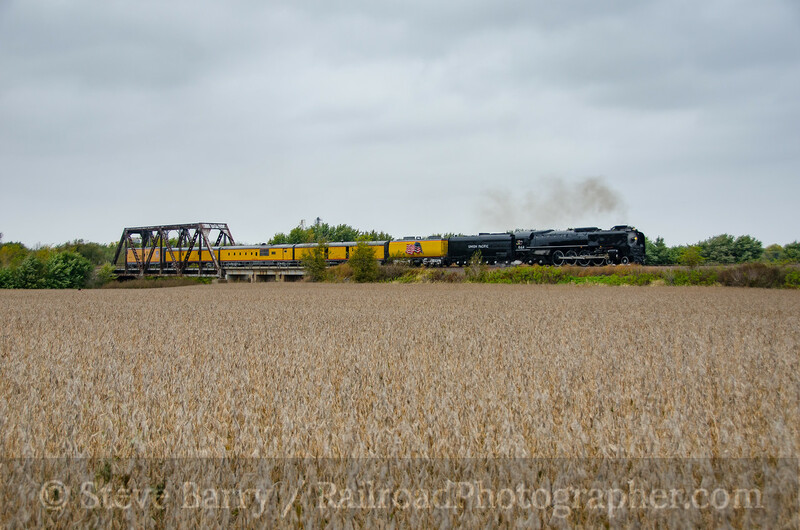 Union Pacific 844; Blackwater, Mo. 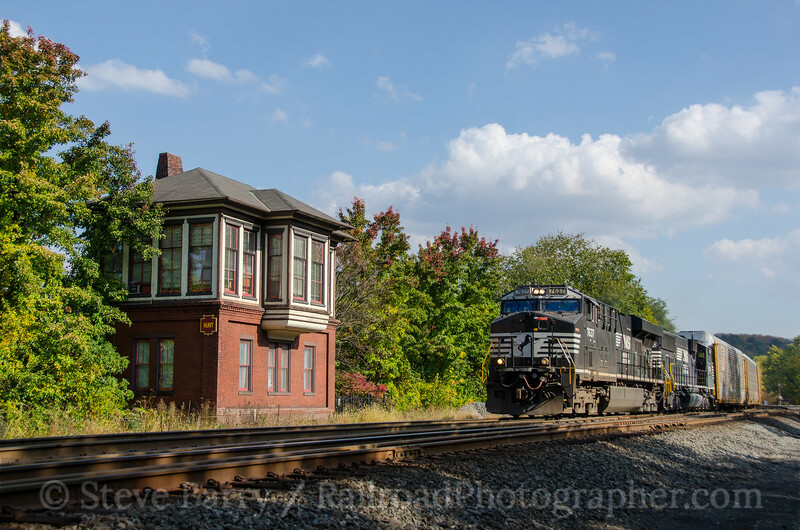 The train's next stop was in the historic community of Blackwater, Mo. 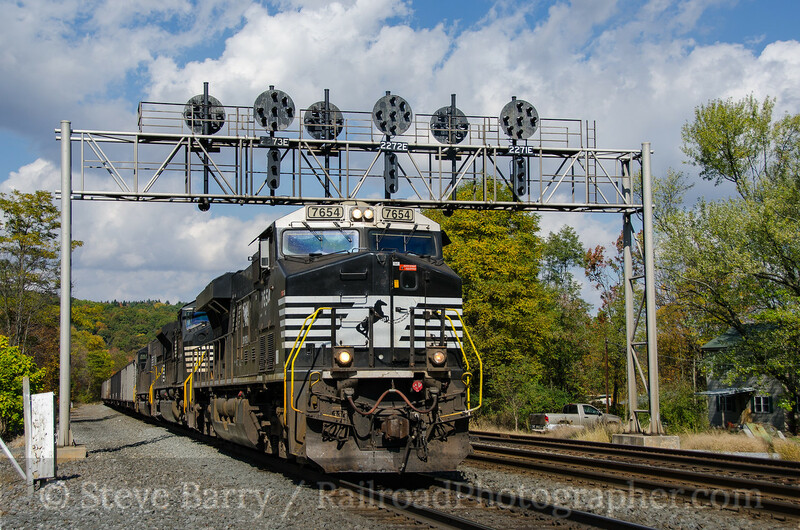 We wandered the dirt roads east of town and set up on an overhead bridge for a telephoto view of the train swinging through a curve (top photo of this post). 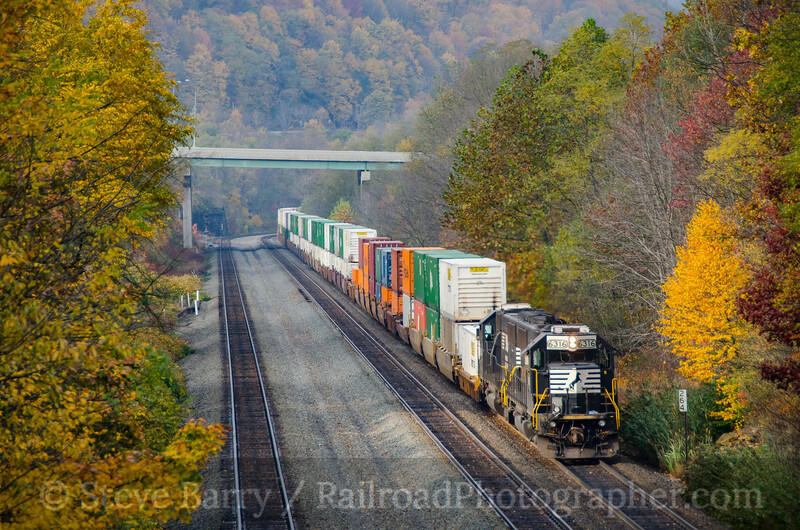 Then came the wide-angle view looking down at the train from the same location. The end of the run at Jefferson City was now on the horizon. 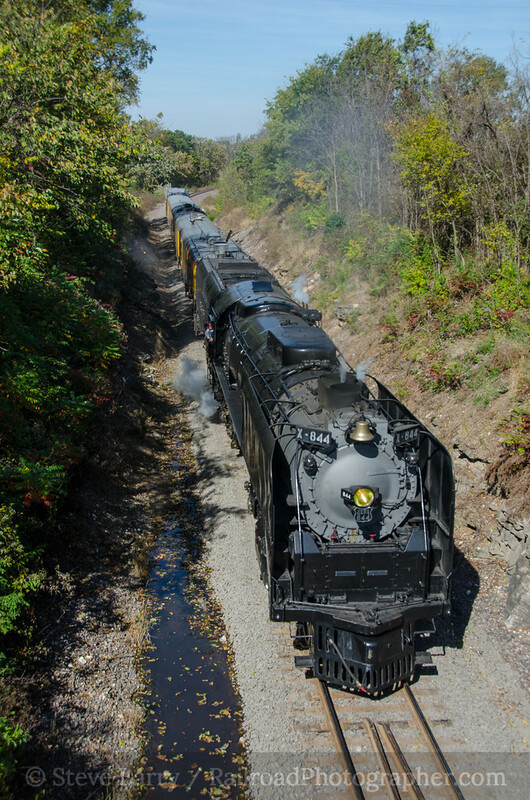 Our last shot of the locomotive on the road would be just west of Jeff City at Marion. At Jefferson City the train had to be put on its display track near the UP yard. 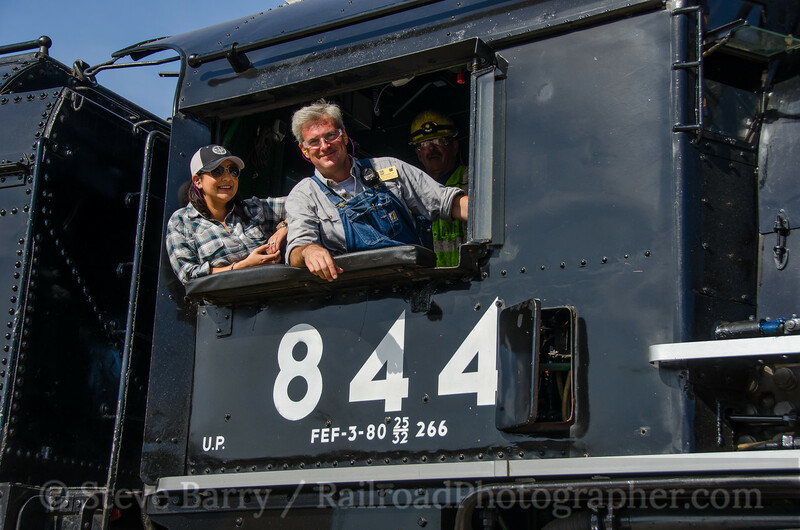 As the train moved back and forth, engineer Ed Dickens (who just happens to be UP's Senior Manager of Historic Operations) was joined by his wife Nancy in the cab. 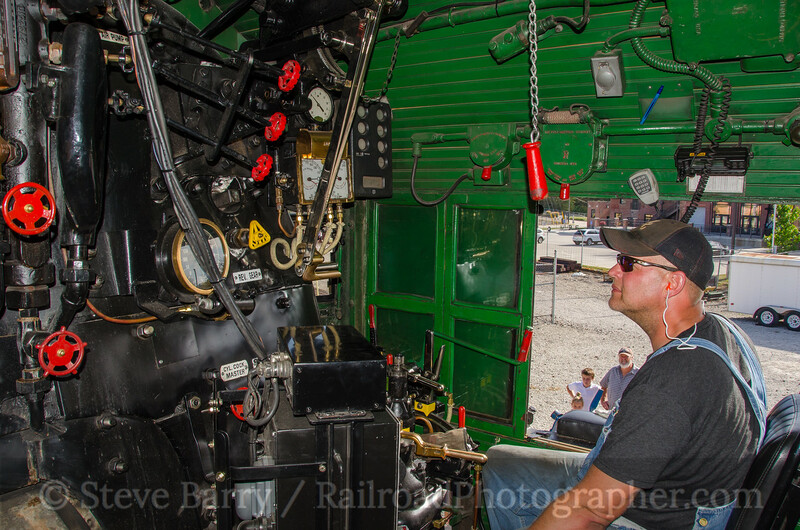 Speaking of the cab, I had a chance to take a quick look inside during the Jeff City stop. 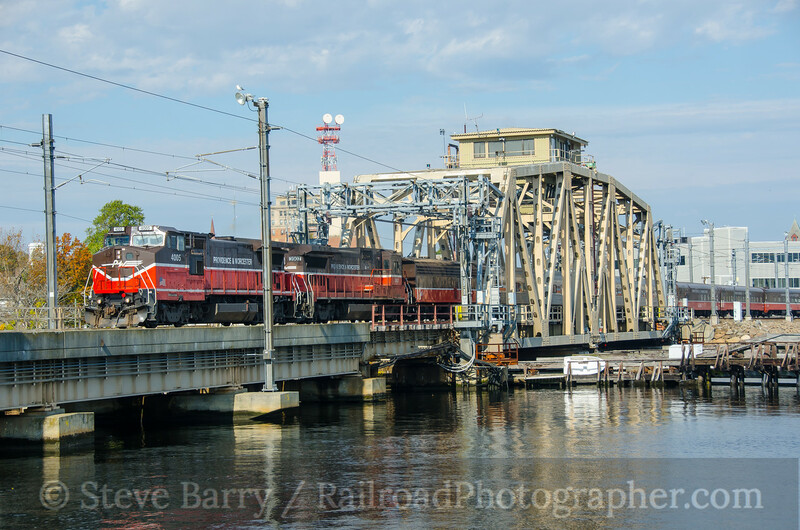 The 844 is one tall locomotive, and it's probably the highest gangway I've ever had to hoist myself up. 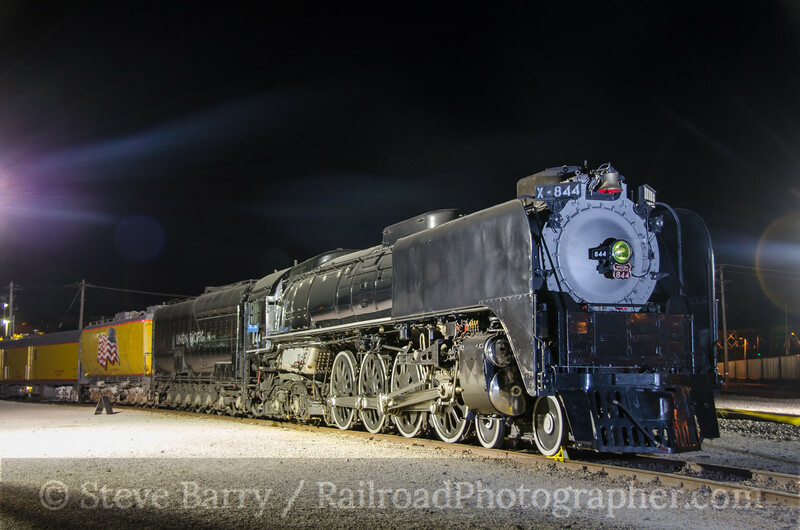 After dinner, a small group gathered in Jefferson City for a night shot of the big 4-8-4. 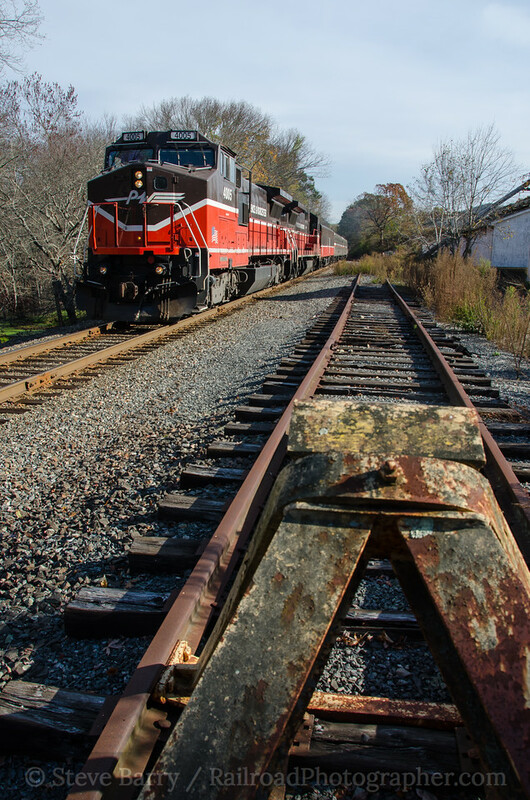 For many, the chase would continue -- for some, all the way to Memphis. 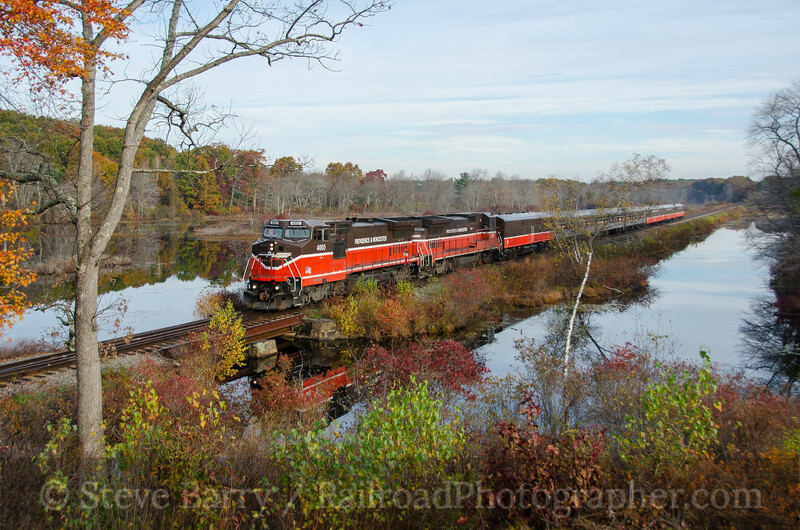 But for me, it was farewell (for now) and I continued to head east that night, wondering if 844 and I would have another chance encounter at some point. In the first part of the trip we went from New Jersey to Kansas City and on to Crawford Hill in Nebraska. 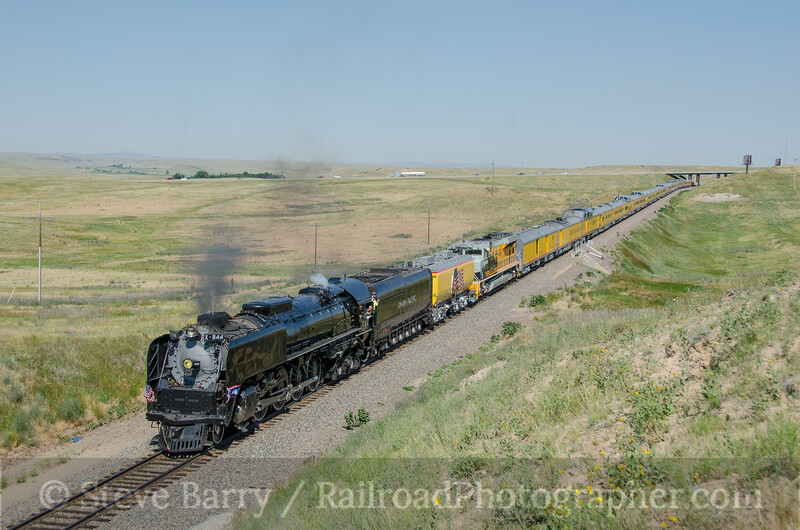 In the second part we went to South Dakota to chase steam and diesel, then headed into the Powder River Basin and Sherman Hill in Wyoming. In the third part we hit a variety of short lines in Colorado, Utah, and Arizona including Deseret Power, Navajo Mine, Apache, and Copper Basin. 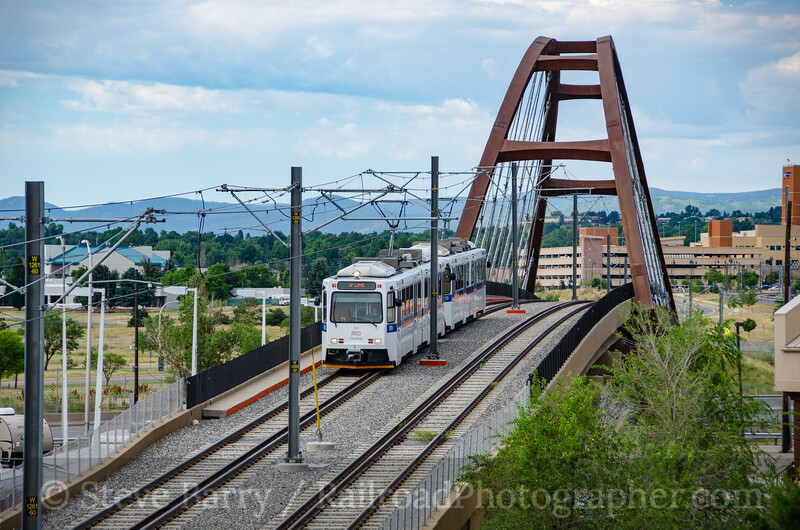 In the fourth part we hit New Mexico, including the Rail Runner commuter trains into Albuquerque and Amtrak's Southwest Chief. In this fifth and final part, we head into Denver before heading back to New Jersey. The first day in Denver was Day 17 of the trip -- July 19, 2016. I was in town for the National Railway Historical Society convention, but the convention's first day was spent riding the Royal Gorge Scenic brunch train. With no photo opportunities available on that trip, I opted to do my own thing around Denver. 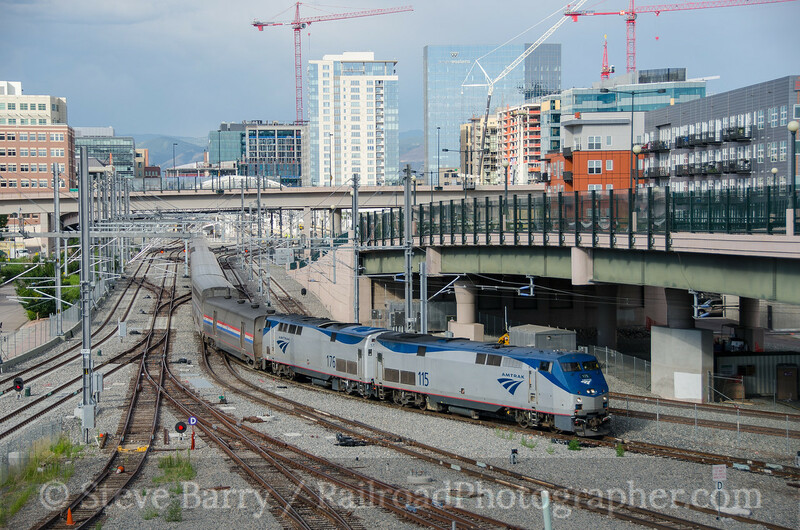 The day was spent getting acquainted with the new commuter rail system between Union Station and the airport on the parts near the convention hotel, but in mid-afternoon I headed into the mountains to catch Amtrak's California Zephyr coming out of Moffat Tunnel. The shot I wanted was from an overlook reachable by driving the former roadbed of a long-abandoned railroad over Rollins Pass. I thought the shot was from the first switchback on the road, but after driving a long way in and encountering a road that was more and more rough, I turned around well short of my goal. As I drove back out, I discovered I had actually passed the overlook (only about a half-mile up the hill) and just didn't see it because I was concentrating on the road. I paused at the overlook and was rewarded with the Zephyr coming out of the tunnel. 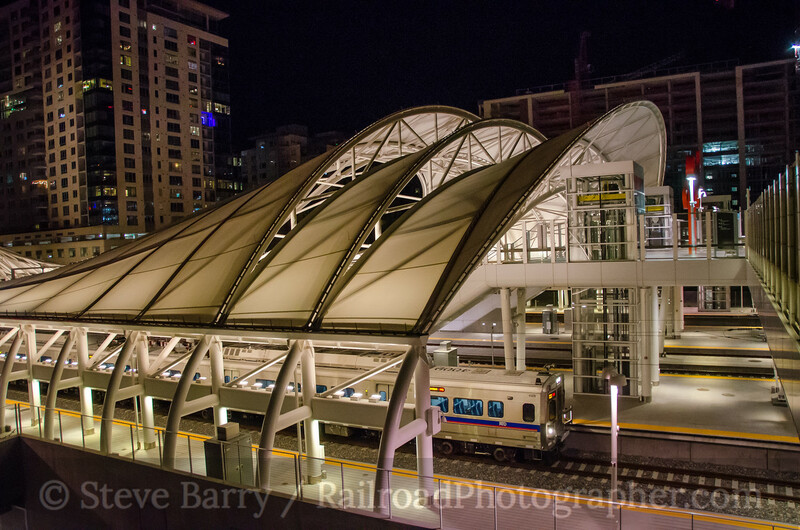 Day 18 of the trip had the convention heading for a light rail tour of Denver's RTD system. 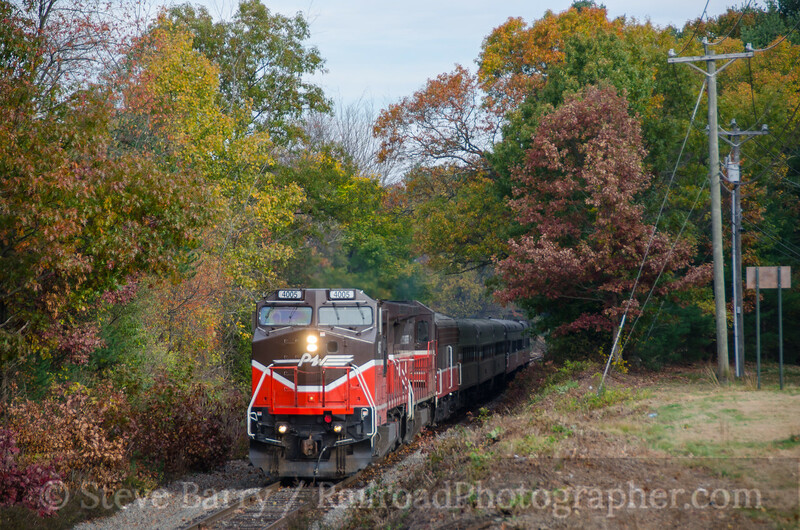 Once again, with limited photo opportunities on the convention trip, I headed out onto the new heavy rail system, this time riding it end-to-end. At the airport I found a large platform from which to shoot trains as they emerged from the Westin Hotel and terminals. The other end of the line is at Denver Union Station downtown. 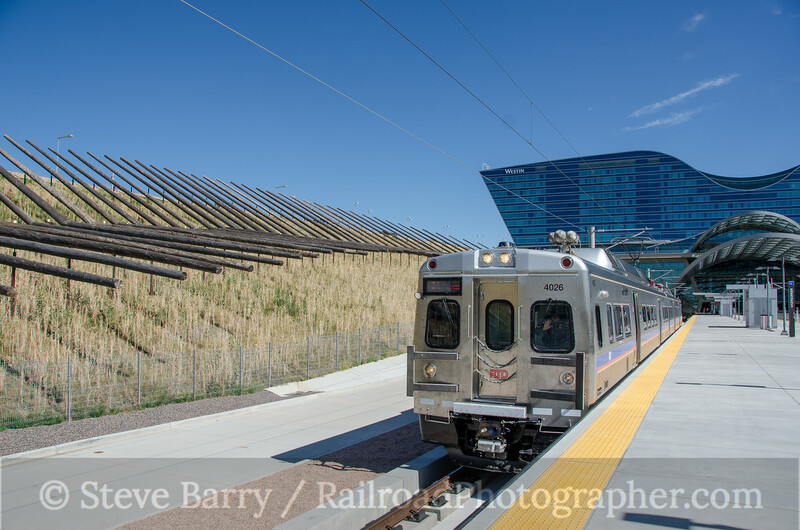 The airport line is the first heavy rail line to open, but two more were undergoing testing for opening later in 2016. 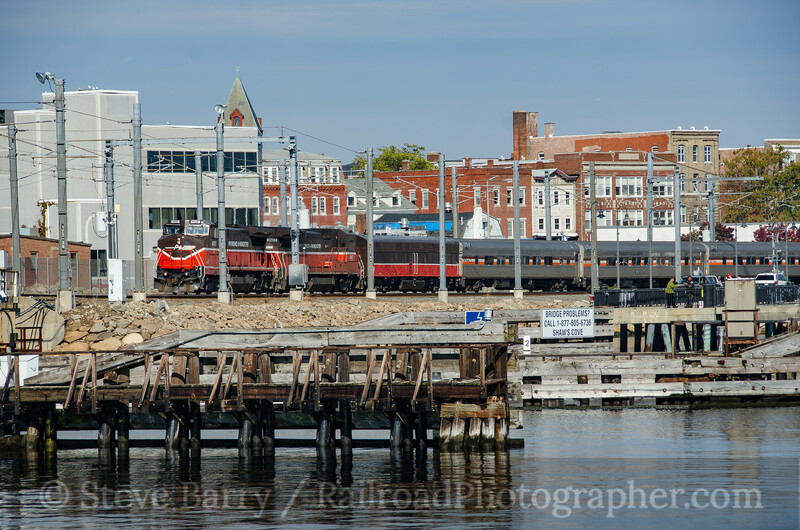 The cars used are Silverliner V cars built by Hyundai Rotem similar to those operating in Philadelphia. 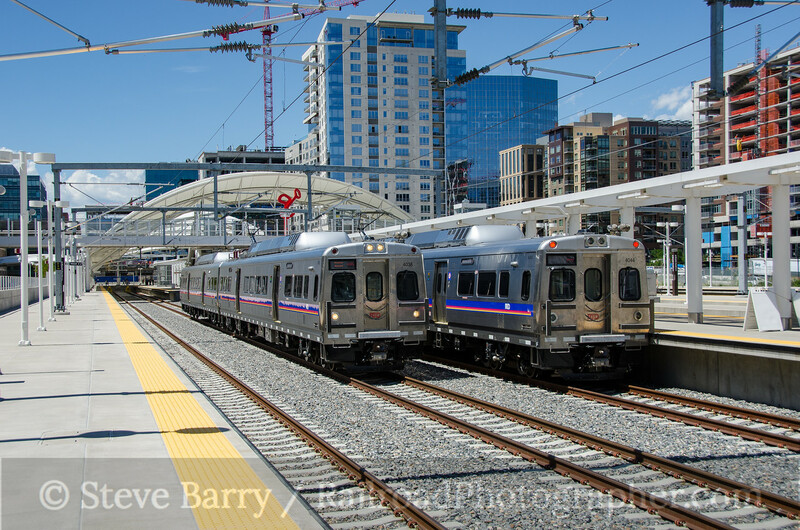 Just as these photos were being taken, Philly's Silverliners were being taken out of service for a manufacturing defect; the Denver cars were apparently unaffected. 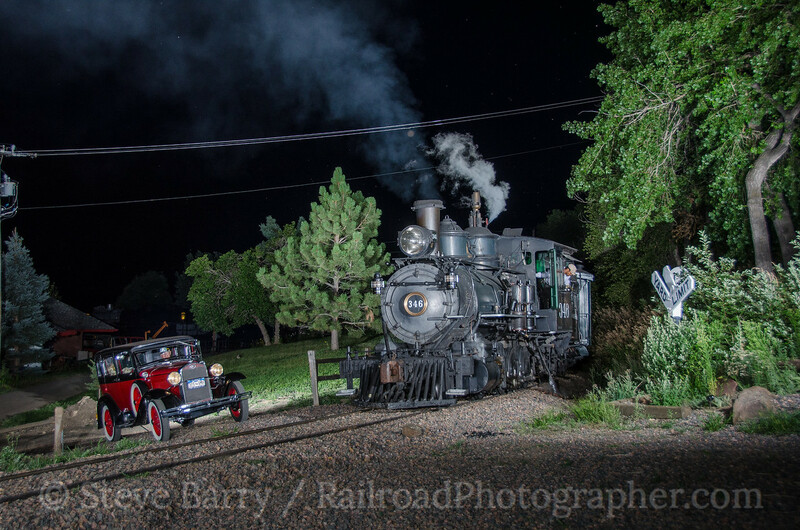 Day Three of the NRHS convention (and Day 19 of the trip) had the NRHS heading to the Colorado Railroad Museum in Golden for an afternoon of activities and a night photography event. 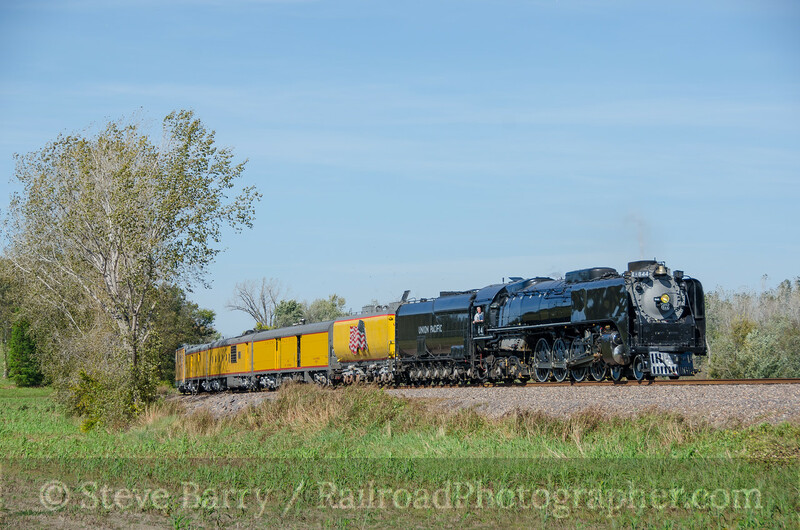 There was time in the morning, however, to get Union Pacific's freshly restored 4-8-4 steam locomotive, No. 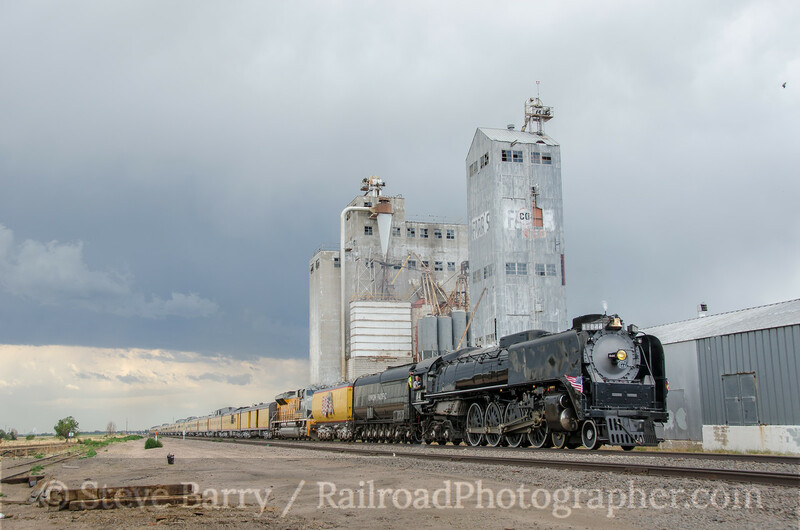 844, as it traveled from Cheyenne, Wyo., to Denver to get ready to power an excursion in a couple of days. The big Northern was coming out of Cheyenne as it headed through Speer, Wyo., on its way south. 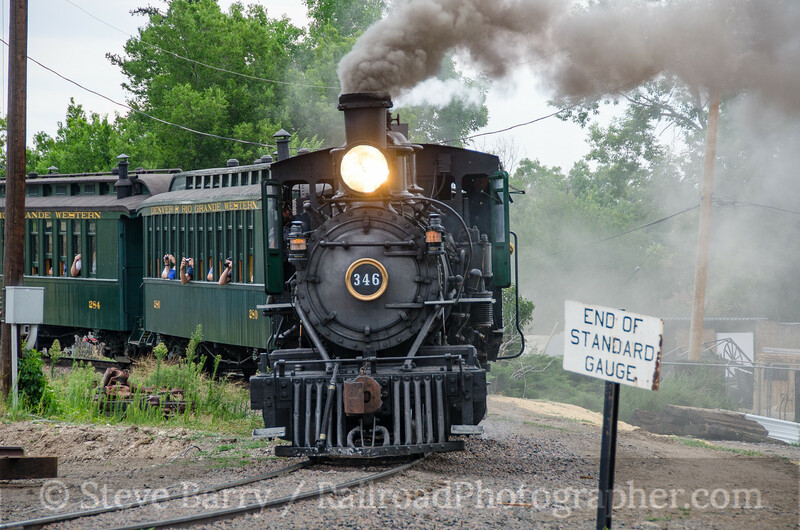 Once the chase with 844 was done, it was time to head to the Colorado Railroad Museum. Denver & Rio Grande Western 2-8-0 No. 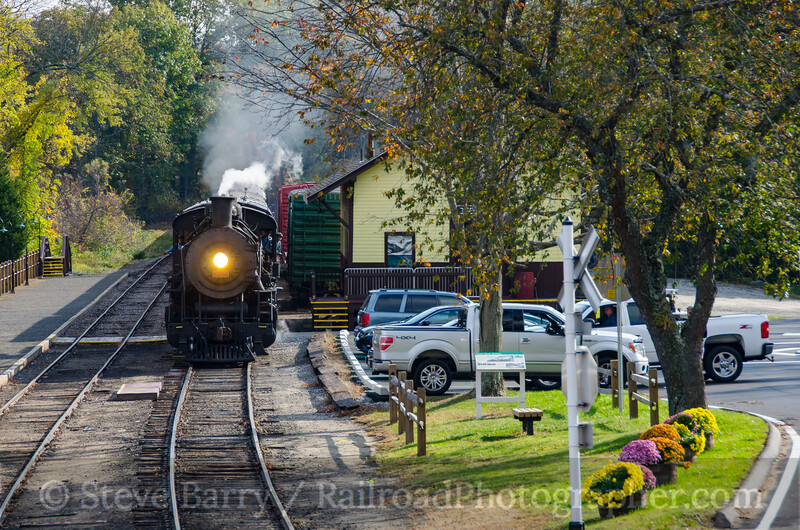 346 was powering a passenger train every half hour on the museum's narrow gauge loop. That evening, No. 346 was the star of the night photo session. Four different scenes using the Consolidation (and three additional scenes using other museum equipment) were shot during the event. Day 20 of the trip was unusual -- no photos were taken! I am on the board of the NRHS and the day was spent with meetings and the banquet that night. It was back to photos for Day 21, however. 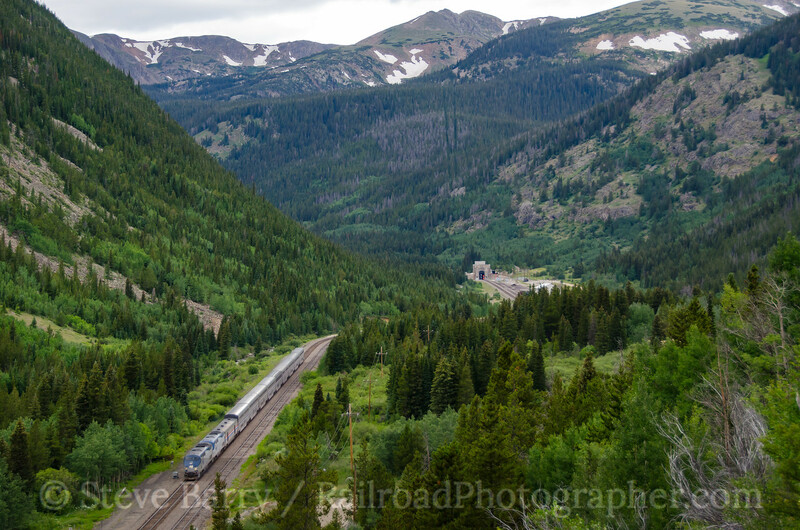 with the NRHS venturing to Leadville, Colo., to ride the Leadville, Colorado & Southern railroad. 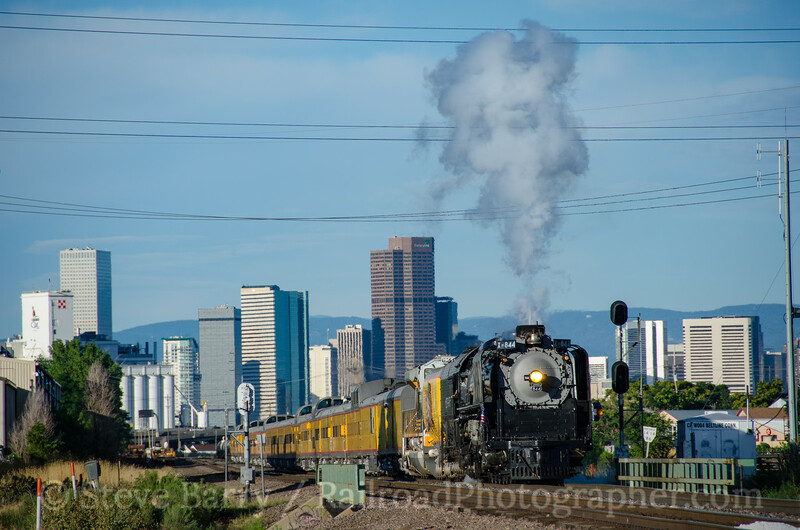 But first there was time to catch UP 844 as it powered the Denver Post's Cheyenne Frontier Days train out of Denver. Back in Denver, the convention attendees boarded buses for the ride to Leadville. 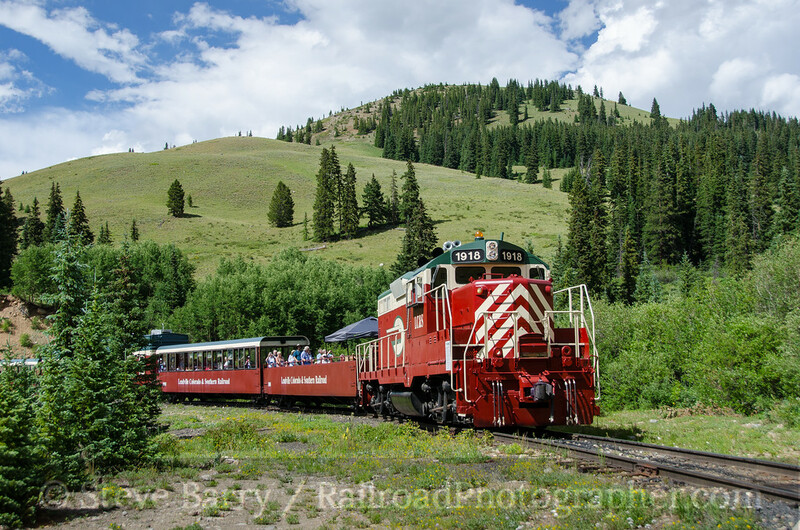 Once there, everyone got on the train for a ride on the former Denver & Rio Grande Western branch from Leadville to Climax, Colo. 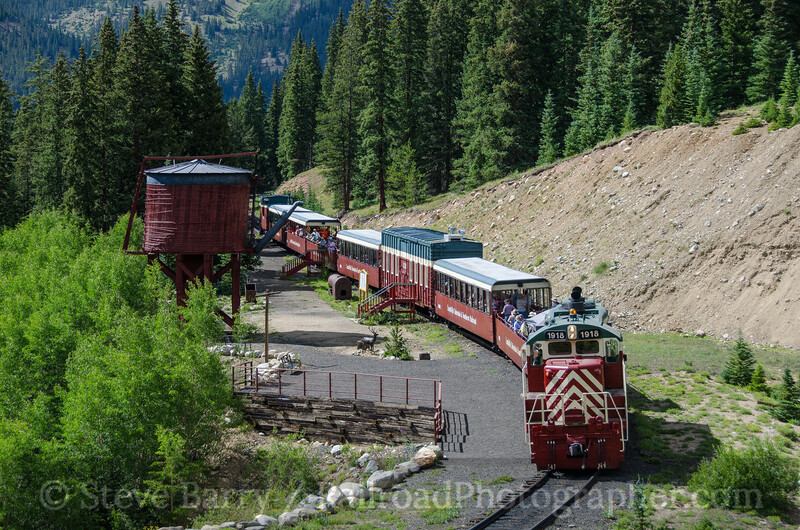 This line hits an elevation of over 11,000 feet, making it the highest standard gauge railroad in North America. A photo stop was held at French Gulch water tank at an elevation just shy of 11,000 feet. An alternate angle at the photo stop location shows the water tank at French Gulch. 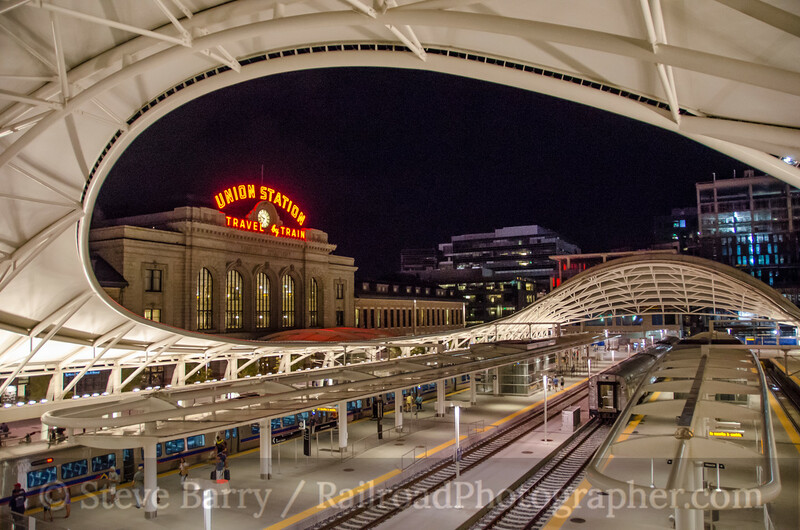 Once the buses had returned everyone to Denver, I headed out with Nick Hovey to photograph around Union Station at night. The train from the hotel to the station was packed -- the line is certainly well-used and the area around Union Station has a vibrant night life. We spent about an hour shooting around the station (including the top photo in this post) before heading back to the hotel near what was Stapleton Airport. Day 22 of the trip would feature something unusual -- a chase of UP 844 by bus for the NRHS convention. But that trip didn't leave until noon, so I had one final morning in Denver to get some shots I wanted. 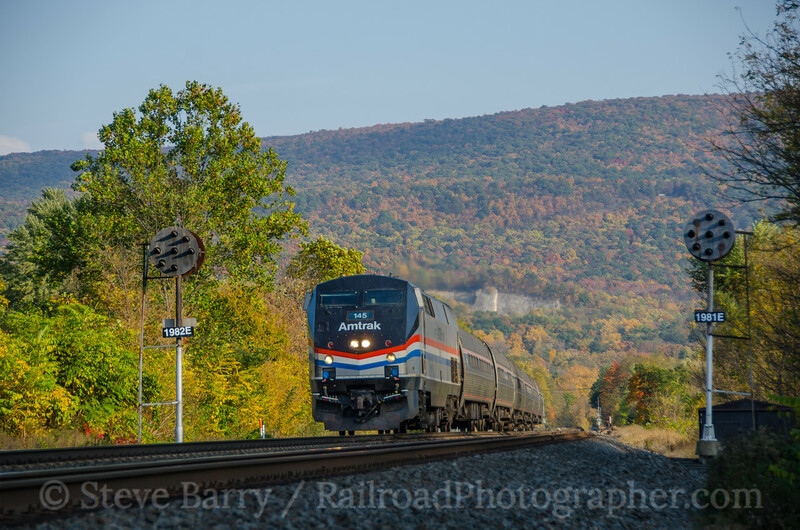 First up was heading back to Union Station to get the westbound California Zephyr leaving town. From downtown I headed out towards Golden to get some light rail shots. 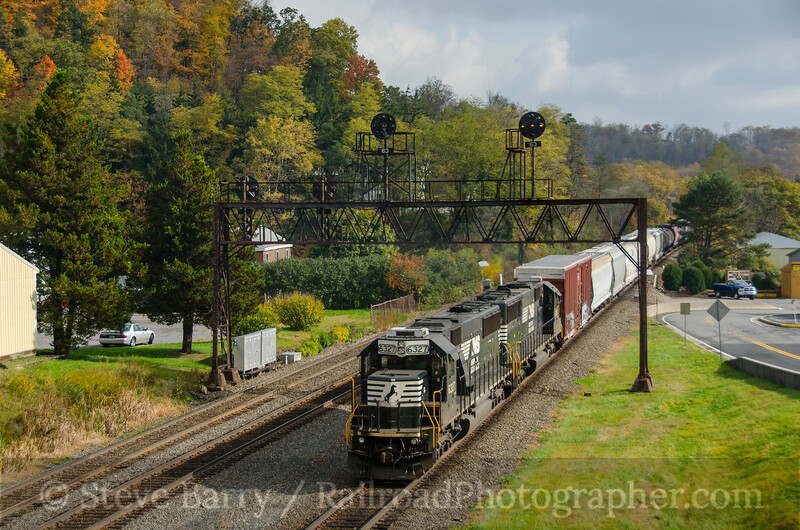 The highlight was a train crossing the unusual basket-handle arch bridge over U.S. 6 at Lakewood. 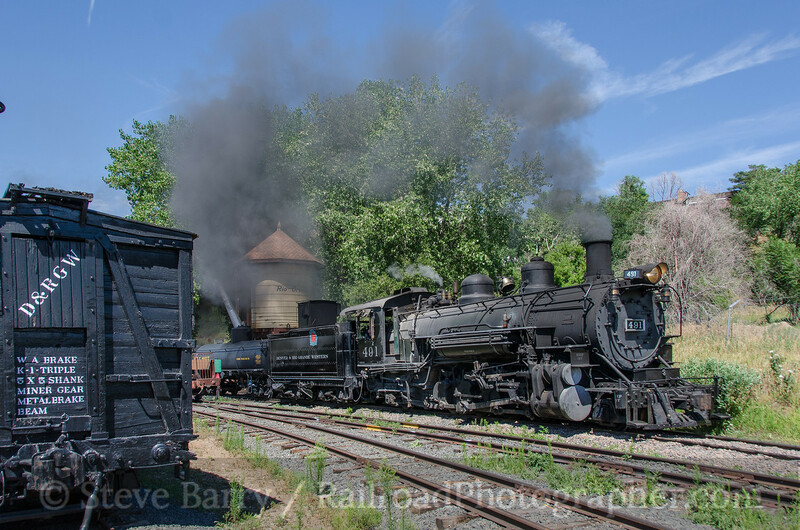 Meanwhile, the Colorado Railroad Museum had its "big" engine operating, 2-8-2 No. 491, so it was back to Golden to get the Mikado making the loop around the museum grounds. Finally it was back into town for the bus chase with 844. 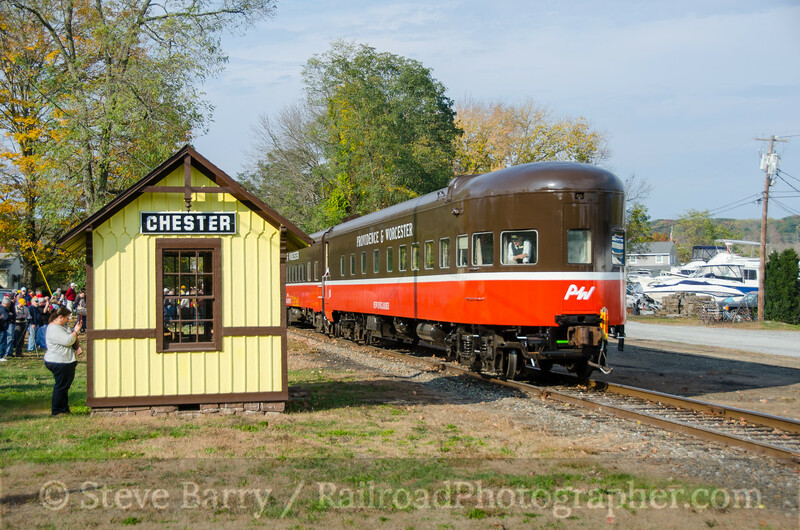 I drove my own car as a support vehicle for the chase, while 50 NRHS attendees were on the deluxe motor coach. 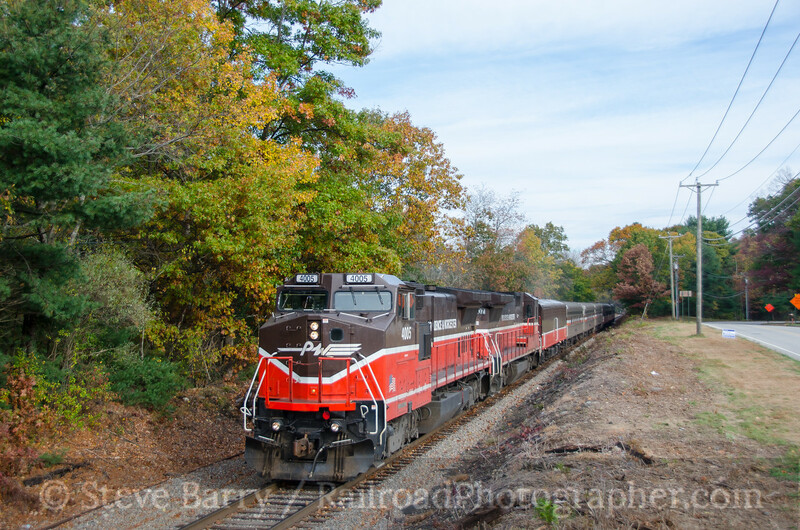 After shooting the train in the yard prior to departure, our convoy headed north (the bus, me in my car, and two other support cars) where we actually caught the train three times. 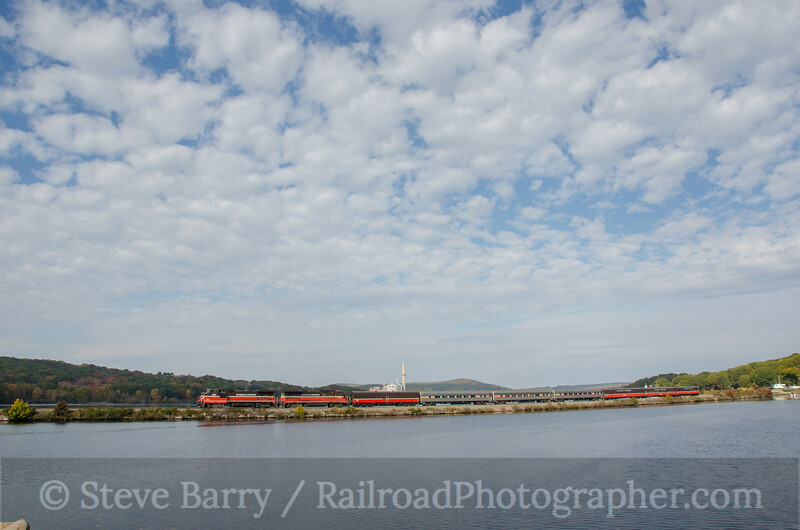 Our final shot was of the train roaring through Ault, Colo., on its way back to Cheyenne. Once the final shot was done, I broke away from the convention to start the long drive eastward. 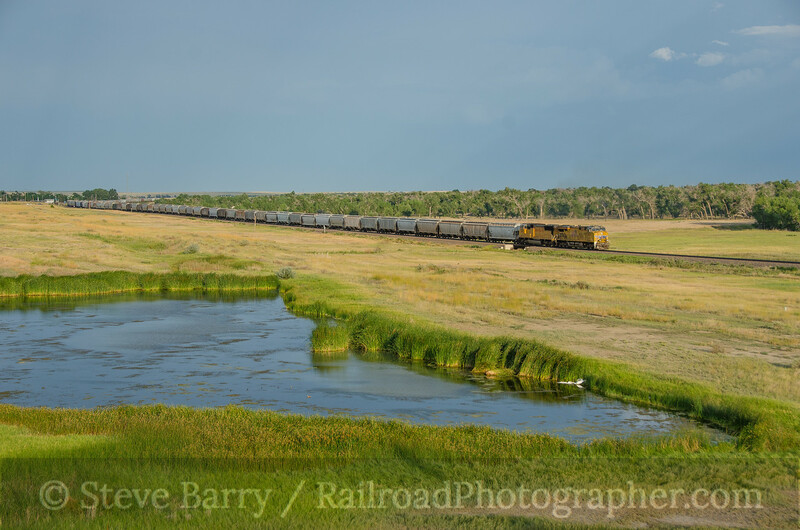 In some of the last sun of the day I caught a Union Pacific freight heading west out of Limon, Colo. From here it was a run to somewhere in Kansas where I stopped for the night (back to car camping after enjoying six nights in a real bed). It was not much but driving for Day 23 of the trip, heading across Kansas and Missouri. The interstate goes near Granite City, Ill., and by late afternoon what had been mostly cloudy skies gave way to sunshine. 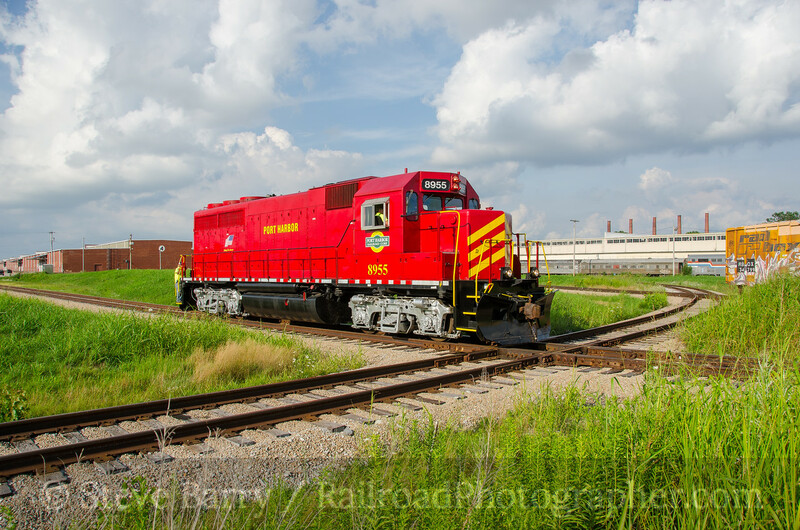 The Port Harbor Railroad (operated by Respondek Rail) serves a port (obviously) near Granite City, and I have a few friends that work for the railroad. 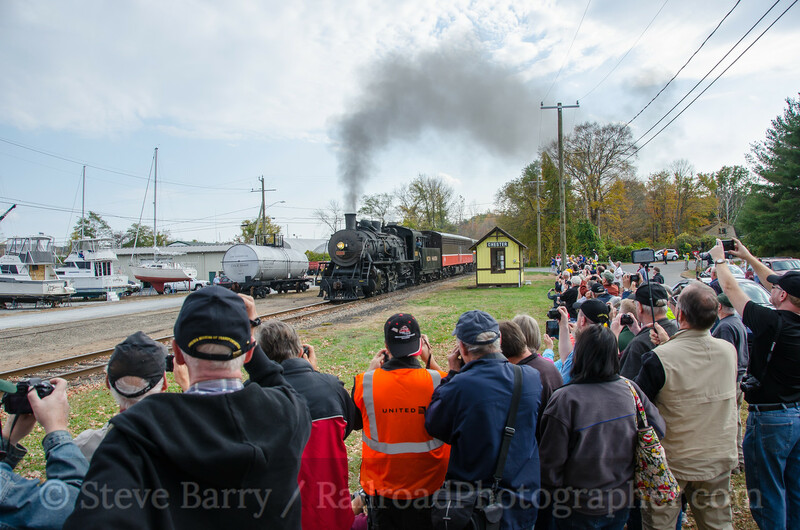 Knowing they usually run in the afternoon, I swung by and found friends (and brothers) Mark and Mike Mautner working the ground with Scott Nauert running the locomotive. They had a lot of work to do on the maze of track, providing some nice photo angles. But I had miles to knock off still, so after a couple of final shots I bid them farewell and continued east. That night I pulled into a rest area on the Indiana/Ohio border for some sleep. Day 24 was strictly a driving day (the third day of the trip where no photos were taken), arriving back in New Jersey in early evening. Finally the trip was done, with 9,827 miles on the odometer. But while I was on the trip, my boss set up a business meeting in Kansas City for two months hence. Head back west again? Sure!